Your website is a credibility piece for your brand. Today’s consumers expect to have a flawless experience on the Internet. They want to shift seamlessly from their mobile devices to their laptops without ever missing a beat. Your website must be ready. Any social media or content marketing campaign is most effective when paired with a strong web presence. Your website acts as the hub for your marketing campaign – a place to drive visitors once you engage them online so that they can learn more. Our team studies changing trends and technologies to create sites that inform, engage, and convert. From simple sites for local businesses to custom web applications, the KWSM team offers website solutions for every sized business. We work closely with clients to establish the desired look and feel, develop an ideal user experience, craft the message, and create custom graphics. No challenge is too big or too small. All of our sites include custom copywriting, online optimization so that you can be found easily in search, and membership in our monthly website management program to ensure that your site functions well for years to come. Are you ready to launch a website that builds your credibility, converts visitors into customers, and generates the results you’ve been looking for? We’re waiting to hear from you. 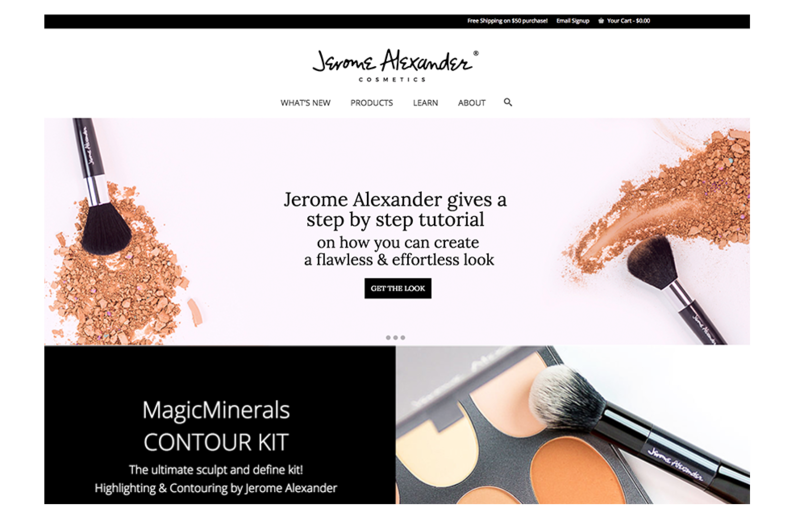 Jerome Alexander Cosmetics had been a popular drugstore brand for years, but they wanted to increase their online sales and reach a younger buyer. We redesigned their website, giving it a clean, modern look that focused on showcasing their products and converting browsers into buyers. Within a month of launching and optimizing the new site, both web traffic and online sales had grown exponentially, and we continue to see month over month improvements.